Coaches Edge Game Planning System. Save time and be more effective. Coaches Edge Technologies. The Best Coaches. The Best Content. Interactive. I’ve shared my notebooks of online resources over the past few months. As you spend the last few days of preparation before the season, you may be looking for a coaching point or video to help with your installation. This post provides a link to all of the resources I’ve posted. There are hundreds of links to presentations, analysis articles, clinic articles, forum threads, and videos. All links take you to information that is free. Creating an Offensive System gives you ideas for ow to go about putting together your system with specific regard to the language and terminology to create it. Discussion on all components needed for well rounded attack and fitting together all components for a fluid system is discussed. Tempo and Procedures Part I. Setting up procedures to attack a defense. Gives ideas of how tempo can be used in an offensive attack. Details a procedure for sideline substitution. Tempo and Procedures Part II. Discusses slowing down tempo at times to manage the game. Details no huddle procedures to slow it down, as well a purposes for huddling. Tempo and Procedures Part III – Speed it up. Discusses ideas for multiple uptempo procedures as well as suggestions on how to become an uptempo offense. A Multiple Run Game with Zone Schemes. Illustrates, with plenty of video cut-ups, different ways the zone game can be used. Gives a method for simply incorporating both read game and traditional hand off into your offense. Methods for Teaching and Practicing Your System. Discusses how to make your practices and drills fit the needs of your concepts and schemes. Coaching the tailback in the stretch play is used as an example of how to set up drills and practices that give you direct game application. Don’t Get Jumped in the Alley. Gives detailed technique with still shots, diagrams, and video on how receivers release an alley defender. Illustrates the importance of this technique in proper distribution and spacing of routes. Using Tight Ends in Your Offense. Discusses many different ways a tight end can be utilized in your offense. Loaded with video. Quotes from Chris Brown and Andrew Coverdale. Details how to incorporate and coach the TE. Lists the Benefits and advantages of using a tight end. The Basics of Creating a Multiple Pass Concept. Discussion of concept based teaching and its advantages in creating a multiple passing game that extends across multiple formations and personnel groups. Lists specific steps to conceptualizing a pass play. Naked/Play Action Concept is used to illustrate concept passing. Adding a Wrinkle: Strategies for Movement. Using motion for specific purposes: changing gap responsibility, changing defender responsibility, taking advantage of a defensive adjustment, and creating total confusion. A Process For Adding a Wrinkle. Adding wrinkles throughout he season in order to stay ahead of the defense. Adding a Wrinkle: Attaching a Screen to Your Best Concepts. Adding a wrinkle by creating screens off of your most successful plays and concepts. A Bag of Tricks. Specific thoughts on installing and using gadget plays. Video on different categories of gadget plays. Stick-Draw Concept. A variation of the popular stick draw with the quarterback as the runner. Discusses the advantages of using the QB to run the draw. Our Evolution of the Pistol Set. 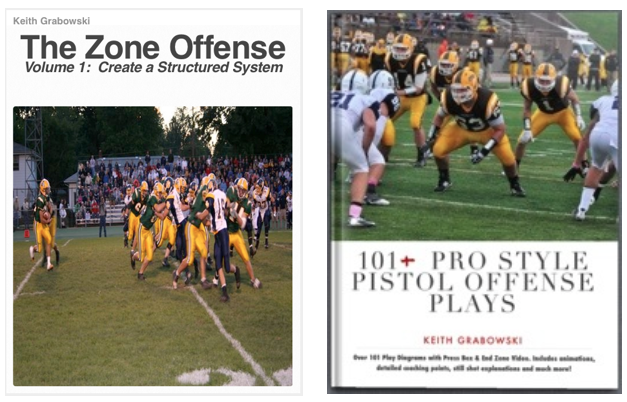 Details on how the use of the pistol has evolved for us and the advantages we have found in ball handling and footwork in the run game that have led to a more effective play action game. Pin and Pull Sweep. Why we use the pin and pull and how it has become a very multiple scheme for us. Illustration with video of the different variations and applications of the scheme. Two important considerations when adding any play to an offense. 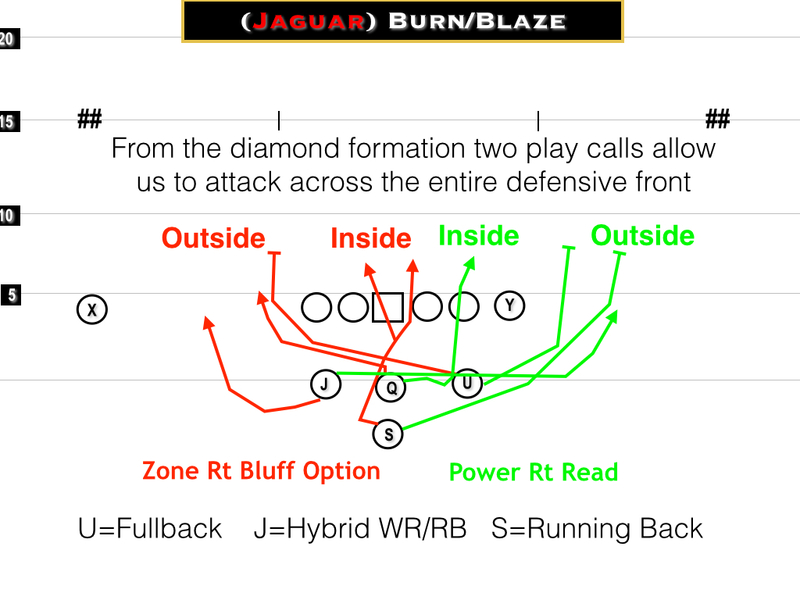 Adding Multiplicity with a Flexible Run Scheme: The Counter Play. Illustration of how the counter play can fit into a multiple personnel, multiple formation offense. Illustration of scheme with diagrams and video. Sweep Action to Enhance the Inside Running Game. Illustrates different types of receiver sweeps that can be used with the inside running game. Points for how to incorporate receiver sweeps. Supplement to magazine article: An Evaluation System For Your Quarterback. Make your QB evaluations objective by focusing in certain performance criteria. Use the system to help you make decisions on exactly what need to be done in practice to get your QB performing at his best. Multiple Passing Attack with the Spacing Concept. How you can incorporate several concepts that many offenses teach separately into one teaching concept with variations to one player. The spacing concept can be used to create horizontal stretches of the defense and is high percentage. Distort and Displace with Double Teams. Specific illustrations of ow to create powerful double teams in both zone and gap concepts. Includes teaching progression and drills. Just Wing It. The advantages of using a wing in any offense. Includes plenty of video of the multiple of a wing. Four Keys to Successful Four Verticals. Explains how concept based teaching, detailed route running, a consistent progression, and simple adjustments make this a powerful passing concept. The Play Action Pass: Tying Runs to Pass Concepts. Shows how to create a more effective and multiple play action passing game by combining components of your offense in a simple way. More For Less: Creating Drills to Maximize Practice Time. Receiver and QB Drills are used to show how to improve multiple skills within a single drill. Discussion of setting up drills to remedy certain technique errors. Maximize Practice Time – Coaching the Big Skill Positions: QB, RB, TE, FB, H-Back. Different thoughts in getting more out of the big skills practice time and incorporating timing for the play action pass. Drills to work these positions on video. Evolution of the use of he quick passing game. Discussion of the quick passing game and how it is being paired with other components of offense for a more powerful attack. Examples from Dan Gonzalez, Dub Maddox, Chris Brown and others. Plenty of video examples. Using The Proper Tool: Pulling Technique. Explanation of what different types of pulls should be used for and specifics on techniques and drills for each. More Bang For Your Buck with the Power Scheme. Illustrates how the traditional I formation blocking scheme can be used in multiple ways. Over the past few seasons a full house backfield from the pistol set, also known as the diamond formation has become popular. Oklahoma State, Oklahoma, and West Virginia popularized it in the college ranks, and the Niners and Redskins have used it effectively in the NFL. For teams that can put some speed on the edges with talented receivers and force a two safety defense, advantages can be found in the run game with essentially nine on seven in a balanced set. Because of the number of backs (or fullback/H-backs) and position in the backfield, adding blockers to one side or the other is an easy way to get a +1 or more advantage for the offense. The set can be used with traditional pro style runs, zone read and options schemes. Here is a list of resources that can be found on the Internet. Special thanks to my student assistant Garrett Mack for compiling this list. The Pistol provides a variety of different ways to attack with multiple formations, and the diamond set can be advantageous out of a number of different personnel sets. I’m sure we will see the use and innovations with this set grow in the 2014 season.